Chinese cooking techniques, ingredients, and recipes have long been a major influence in Thai food. This recipe is one example of the fusion of these two wonderful cuisines. Salty and savory, chicken and salted fish fried rice is so good, it can become addictive! 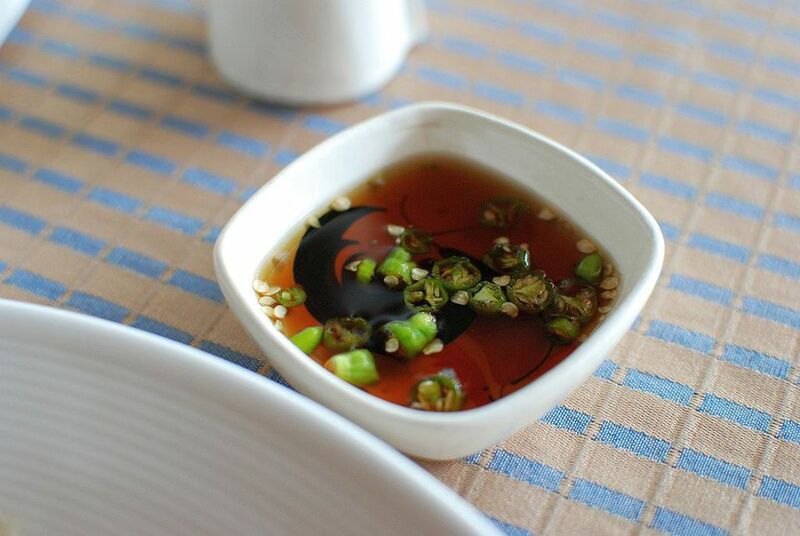 To achieve the right flavor, you will need real fish sauce for this recipe, which can be purchased by the bottle at any Asian market or grocery store. Using a sharp knife, cut away a few strips from the flesh of the salted fish (it is very firm, so be careful not to cut yourself). Now cut or chop these strips into small cubes of fish. Don't worry if there is a little bone left in as this provides added calcium to the dish and is easily eaten. Place about 1 cup of cut fish in a bowl of hot water to soak (and soften) for at least an hour before cooking (or up to 8 hours, or even overnight). Wrap the rest of the dried fish and refrigerate for use later (salted fish stays good for many months in the refrigerator, as the salt preserves it). To prepare the rice for stir-frying, pour 1 tablespoon oil into the rice and work it through with your hands, separating clumps as much as possible. If rice is several days old, it will separate easier into individual grains. Set aside. In a small frying pan, place a little oil (or use butter), and scramble the eggs. Set aside. Place a wok or large frying pan over medium to high heat. Allow to warm, then add 2 tbsp. oil. Tip the wok to ensure the oil covers the entire cooking surface. Add the garlic and chicken, stir-frying until chicken is cooked (1 to 2 minutes). ​Note: Add a little chicken broth when wok becomes too dry. Drain the salted fish and add to wok. Stir-fry 1 minute, continuing to add chicken broth 1 tbsp. at a time when pan becomes too dry. Add the rice and continue stir-frying. Note that at this point the pan should be dry so that you can hear the rice "popping" as it fries. Add the peas and 1 tbsp. fish sauce. Stir-fry to mix in. Add the cooked eggs and mix in. Do a taste test for salt; this dish should be fairly salty -- this is its primary characteristic. Add up to 1 tablespoon more fish sauce if not salty enough. If too salty for your taste, add up to 1 tablespoon lime juice. Add the spring onions and stir-fry to mix in. Serve hot from the pan with a sprinkling of fresh coriander, if desired. Serve a small dish of Thai chili sauce on the side, for those who like it spicy.